Ellen Bartfeld repurposes colorful gemstones so they can live to dazzle another day. 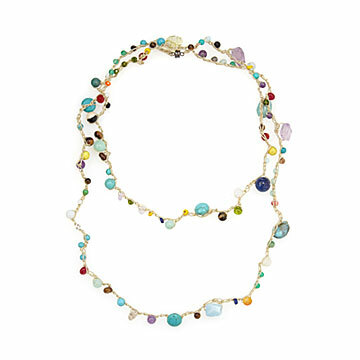 Ellen Bartfeld salvages stones from the production of her Birth Month Mini Dish so that they live to dazzle another day in this colorful necklace. She threads gems in kaleidoscopic shades together to create a one-of-a-kind piece of jewelry that can be worn long or doubled up to add extra dimension. Handmade in California. I was very impressed with the workmanship and how lovely it looks. Necklace is attractive. We prefer aqua colored jewelry and this is perfect. A great gift! Happy Birthday to me! I am never disappointed purchasing "uncommon goods" gifts. The Castaway necklace I was told by my son was beautiful and fits all dress occasions for his wife. I was so surprised to hear that my daughter-in-law also received earrings to match. My son asked me where I got it and about Uncommon goods. I told him I have ordered several gifts from this company and have never been disappointed. My son and his wife will soon be receiving the spice kit for dipping oil. It wasn't available in time for Christmas but a cool Christmas card was sent in time telling them it was coming soon and from "love Mom"! My daughter was very excited about the necklace and has received numerous compliments when she worn it the first time. Loved it so I bought two! Just to wear actually anywhere. I bought one for Madeline and one for my friend. Use as a bracelet or necklace. love the magnetic clasp!